Any good points the author makes are cancelled out by two extreme manipulations of Scripture within this lesson. At least the author is direct enough to admit that the translation of verse 2 that they "began to be bold" is his own translation. It should send off alarms that with the dozens of English translations available, the author couldn't find a single one that translated it similar to how he has. Why does it make a difference? Is it really that different from "we had boldness"? Yes, it is that different. 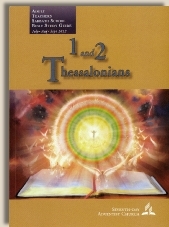 The author assumes that Paul had somehow lost his boldness along the way and started to regain it here in Thessalonica. Yet when, in Scripture, do we ever see Paul losing his boldness? The author has an agenda and is willing to alter Scripture ever so slightly in order to fit the Bible to his agenda. ESV: And we also thank God constantly for this, that when you received the word of God, which you heard from us, you accepted it not as the word of men but as what it really is, the word of God, which is at work in you believers. NASB: For this reason we also constantly thank God that when you received the word of God which you heard from us, you accepted it not as the word of men, but for what it really is, the word of God, which also performs its work in you who believe. KJV: For this cause also thank we God without ceasing, because, when ye received the word of God which ye heard of us, ye received it not as the word of men, but as it is in truth, the word of God, which effectually worketh also in you that believe. SDA lesson: The gospel that they preached was not just an intellectual construct; it was accompanied by the living presence of the Lord as revealed in the lives of the apostles (see vs. 13). Scripture spoke clearly about the word of God working in those who were hearing what Paul spoke. The author twisted this completely around and said it was what happened in the lives of the apostles. Why is this? Because it fits the author's agenda of emphasizing that it was the lifestyle of the apostles, not the message and power of the Gospel, that converted people. Also notice that the gospel that they preach included their lifestyle according to this rewriting of Scripture. Properly understood, verse 13 is referring to the fact that the word of God is active and changes us. This took away the power of the word and instead emphasized the power of lifestyle. What would you point to as evidence that God has changed your life? How is this evidence visible to others? Or is it visible at all? SDAs are often proud of the "in-depth" Bible study, but as we see here, the study that is done is often twisted in small ways to teach something entirely different from what the Bible alone says.